Evidence-Based EMS | Data-driven, patient-centric prehospital emergency medicine. Data-driven, patient-centric prehospital emergency medicine. This is a compact ultrasound device that connects to a phone (or a tablet, I’m assuming) to provide a portable point-of-care ultrasound solution. The probe (there’s only one option, and it covers most POCUS bases) uses advanced technology to get the size down and enough battery life for a full shift. The software looks amazing—making full use of a touch screen to make depth and gain adjustments intutive. It also includes a secure cloud solution to store files and to send imaging as secure, HIPAA-compliant messages. All for under $2,000—which for ultrasound devices, is a great price. 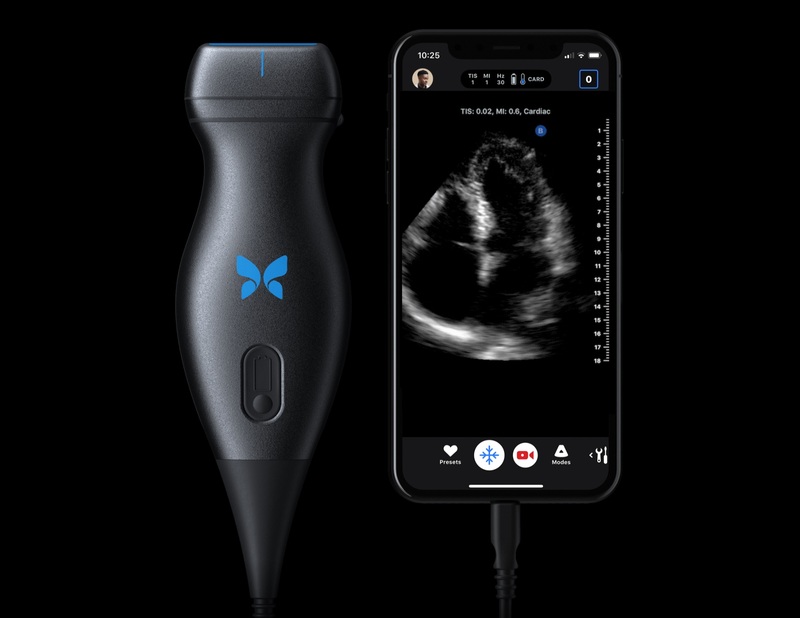 POCUS evangelists have been preaching that the stethoscope is doomed and pocket ultrasound will replace it. This device really shows that potential. Still priced out of reach of paramedics, but definitely moving our way fast. Give it another ten years, and chances are pretty good that ultrasound will be as much an EMS standard of care as waveform capnography and 12-lead ECGs, while your cutting edge paramedics (the ones carrying the electronic/Bluetooth Littmans now) well have one of these in their pockets. Or bat belt. What makes an excellent clinician so good? How do “rockstar” paramedics make resuscitating crashing patients look so easy? As a paramedic educator, I spend a lot of time pondering these questions and looking for the “magic bullet” answers. We are gearing up for our paramedic course starting next month, and I was talking with our senior educator, Rob Atripaldi, about curriculum design differences for psychomotor versus cognitive knowledge domains. Rob had an epiphany—he identified that a key difference between the master paramedic and the typical paramedic was a difference of approach. The master paramedic approaches resuscitation situations by identifying what outcome they want to see, while the typical paramedic instead starts by deciding what treatments are indicated. Here’s an example: You respond to a 67-year-old female patient experiencing a severe COPD exacerbation. She’s been struggling to breathe and using her rescue inhaler for the past two hours, but her energy is just about gone, and she tells you, 1–2 words at a time, that she cannot breathe. Your initial assessment is not great—her airway looks good, Mallampati of +3, but her breathing is rapid, shallow, with severe wheezing in upper lobes and diminished breath sounds in lower lobes. Her vital signs don’t look too hot either: HR 122, RR 28, BP 160/80, SpO2 72% on room air, ETCO2 581. Any competent paramedic is going to pretty quickly recognize that this is a sick patient who needs immediate treatment. The typical paramedic is going to begin thinking about the skills or interventions indicated for this patient—maybe thinking “Albuterol, Combivent, Solu-medrol…” and of course Oxygen, IV, 12-lead, monitor. As the patient continues to deteriorate, the medic may then start thinking about RSI and prepare to intubate. The master paramedic is going to think differently, working backward from the desired outcome. She’s going to start by framing this respiratory failure patient as a ventilation problem leading to an oxygenation problem. The oxygenation problem can be temporarily patched by increasing FiO2 using an oxygen mask; her assessment will lead her to identify the causes of the ventilation problem—probably bronchoconstriction with or without excess mucus production2. Next, she will choose the optimal tools to resolve the bronchoconstriction. Perhaps this will involve inhaled beta-agonists, maybe pressure-support from CPAP—the point is that she is picking tools not by matching their indications to the patient’s current condition but instead by matching their effects to the problems she is trying to fix. The master paramedic has a clear vision of the outcome she is aiming for, identifies the pathophysiologic issues keeping the patient from that outcome, and then picks the best tools to fix those problems. In most cases, these two approaches produce similar treatment plans and similar results. However, in the critical patient with unexpected complications, an outcome focus better equips the clinician to react appropriately. A skills or treatment indication focus sets the paramedic up to fixate on the treatment, not on the result. This anchoring can lead the paramedic to ignore changes in patient status or fail to recognise treatment failures. A prime example is in airway management: Let’s say that the patient above continues to decline, despite our intervention. Having passed the point of respiratory failure, she now begins to lose consciousness, and her breathing starts to slow. Recognizing this, our typical paramedic sets up for RSI, pushes the medication, and inserts a laryngoscope. The patient’s airway is challenging, but no worries—our paramedic has practiced intubation every morning at his station and is confident he can get the tube. However, after two attempts, the patient’s SpO2 is hovering in the 80s, her heart rate has begun slowing, and the paramedic can’t seem to get the equipment to cooperate. Anchoring leads the paramedic—and in fact, the entire team—to fixate on “getting the tube,” and they keep trying different tricks until finally, they use a bougie and a video laryngoscope to place an ET tube successfully. Just in time, in fact, because when they look up at the monitor they see V-Fib, and a quick pulse check reveals the patient has coded. Now, this is not a typical case, but it is a typical response to an unexpected complication. The literature describes these types of scenarios and my personal experience reviewing hundreds of RSIs confirms it. Anchoring is dangerous—potentially fatal when performing RSI. The outcome-focused paramedic is not immune to these biases, but a little more protected. She fixates on the desired outcome, which fundamentally is a patient with a patent and protected airway, adequate ventilation, adequate oxygenation, and adequate perfusion. 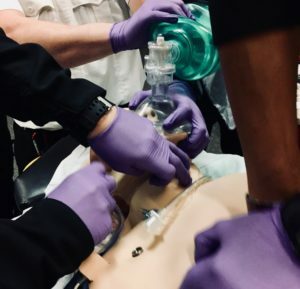 When the patient begins to decline, our paramedic recognizes that the priority problem is now airway protection, and she can start picking treatments based on that goal. Her initial treatment choices might be the same as above, but being outcome-focused would predispose her to abandon futile intubation attempts when they are not getting her any closer to her outcome goal. So how do you teach an outcome-focused approach, especially when paramedic curriculum is overwhelmingly skills-driven? Stay tuned—some ideas for that are coming. Two important studies (COMBAT and PAMPer) were just published that looked at plasma vs. normal saline for resucitation in hemorrhagic shock patients. Although the studies came to different conclusions (reflecting different trauma system environments)1, plasma does seem to confer more benefits when significant fluid resuscitation is required. TCCC guidelines have emphasized this for years, and point to whole blood as being the best choice, followed by platelets/plasma/packed red blood cells. A growing number of EMS systems have begun looking at carrying blood products such as plasma for use in critical hemorrhagic shock patients. My agency has been at the forefront of this in the United States and is approaching two years now with blood products deployed for our ground 911 system. 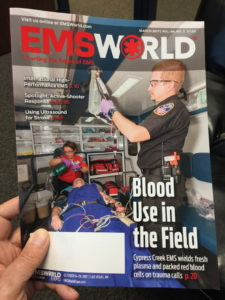 We’ve even got a pretty good article on it in EMS World magazine. The clinical case for using plasma, blood products (such as packed red blood cells), or whole blood has been made and additional research keeps coming out validating its safety and efficacy in the prehospital environment. The key challenge for most agencies is the logistics. The indications focus on signs and symptoms of hemorrhagic shock, and apply to trauma or medical patients. For medical patients, the inclusion of hemoglobin using a point-of-care hemoglobin testing device was an important step. The procedural steps are very straightforward. We tag our blood using a standard “triage tag” which provides a wristband that can be attached to patient and tear-off barcodes that can be used to document which blood unit was provided. The blood type, tag, and expiration date are verified by two medics, then the blood is hung using a Blood-Y and a fluid warmer. Initially, we used the Belmont BuddyLite warmer but we are now using the QinFlow warmer, which has a number of advantages. That’s really it—as a procedure, transfusing blood is very simple. Overall, the most important logistic step in our blood program was securing a positive relationship with our local blood bank. This has involved countless meetings between our senior leadership and blood bank leadership to ensure we meet their standards for storing and handling blood. Our blood program workflow begins with receiving the blood. We store it in a central location in a lab-grade blood fridge and our Logistics Manager tags it with a triage tag, packages it in a plastic container with a “Blood Kit” number, and then takes a photo of the blood label which goes into a central shared folder. We deploy with two field supervisors who respond to critical calls in Ford Explorers and are equipped with a range of extra treatment options (such as ventilators). Each supervisor carries a blood cooler which is stocked with two blood kits, one O-negative and one O-positive. The supervisors also carry the fluid warmer, hemoglobin meters, and additional supplies for administration. The supervisors are dispatched to calls that might need blood products (shootings, stabbings, etc) and may also be requested to scene by crews. If blood is needed, the supervisor starts the blood and rides into the hospital with the patient and crew. After handing over patient care, the supervisor sends a very brief email indicating what run number, blood kit, and blood tag number was used, and then swaps out the now-empty blood kit with a full one from the central blood fridge. We can then immediately order replacement blood (which quite often is delivered within a few hours). We also take the photo of the blood label (from the shared folder) and add it to the patient chart, so all of the codes, barcodes, and other information is now part of the patient’s permanent record. Any high-acuity intervention needs to be carefully monitored in an EMS system. We have to review STEMIs, strokes, RSIs, cardiac arrests, and major trauma calls to ensure we are delivering high-quality, consistent service to our patients and community. Using blood products is no exception. Proper Usage: Did the patient meet the administration criteria? Was blood products indicated and appropriate? We’ve had very few issues with this—our supervisors are clinically saavy and appropriately cautious. Missed Opportunities: With an abundance of caution comes some risks. We’ve carefully monitored for calls that might have been benefited from receiving blood products and then looked to understand why they didn’t. In some cases, it has been a system issue, in others, it was an education issue and the crews who tended to the patient needed some additional clarification. This is monitored using an automated weekly report that looks at patients with abnormal vital signs who meet administration criteria and provides a list of charts to review. Unexpected Problems or Complications: Each blood administration call is reviewed individually to look for problems. As complications are encountered, leadership looks to identify the root causes of these, which in some cases has required tweaking processes or providing more education. Probably the most significant issue we’ve encountered was slow flow rates due to product separation. Working with the blood bank and fluid warmer manufacturer, we determined that gentle “mixing” of the cold blood was necessary prior to hooking it up to the blood-Y. We have not encountered any patient complications or reactions, although we do have procedures in place for this. Education is key for implementing novel treatments or protocols in EMS. We conducted numerous in-person training sessions for our staff followed by frequent continuing education. Many people were concerned that receiving hospitals would react poorly to EMS bringing in patients with blood going. While we’ve had a few isolated complaints from ER nurses, our trauma surgeons, ER physicians, and hospital leadership have all been excited and supportive. To encourage this kind of support, we’ve made a point of reaching out to stakeholders at our hospitals to communicate about our blood program, provide updates, and share our protocols and logistics procedures. Many programs like this still focus exclusively on trauma patients. This is, in my opinion, a mistake. As our medical director put it—hemorrhagic shock is hemorrhagic shock, regardless of what caused the bleeding. And medical patients in serious hemorrhagic shock are a lot less likely to get mass transfusion at the hospital than trauma patients, so our ability to get them blood quickly does make a significant difference. Last: Blood products in EMS is one of those treatments that really seems like science fiction to me. Based on my experience, I kind of have a sense of how seriously injured trauma patients are going to deterioate during my transport to hospital. Blood changes that—these patients pink up, wake up, and mental status improves. Ultimately, blood doesn’t eliminate the need for definitive bleeding control (usually surgical) but it does buy time for the surgeon and reduce the complications usually seen in the Trauma Triad of Death. If you’re EMS agency is interested in deploying blood products in the field, folks at my agency would be happy to help. Contact me and I’ll get you in touch with the right people. Last week, I attended a three-day research workshop hosted by ESO Solutions and the Prehospital Care Research Forum (PCRF). The goal of this workshop was to introduce novice researchers to the research process with practical projects. Overall, it was an astounding success and one of the best workshops I’ve ever attended. On Tuesday afternoon, we went through introductions and met the faculty. The eight participants were all EMS folks in similar roles to me—doing data analysis, clinical quality management, with some day-to-day operational responsibilities mixed in. There was a broad range of research experience but it quickly became evident that knowledge of statistics or the mechanics of writing a manuscript were not as important. What truly mattered was a passion for paramedicine and a skeptical, inquisitive mind. The eight faculty members for the workshop included David Page (director of the PCRF, based at UCLA, and member of the JEMS editorial board), David Wampler (a PhD paramedic at UTHSCSA and part of the San Antonio FD Office of the Medical Director), Remle Crowe (a nearly-PhD paramedic and the NREMT Research Fellow), Lawrence Brown (professor at Dell Medical School and well-recognized EMS research author), Henry Wang (physician and professor at UT in Houston and the researcher behind some of the biggest airway, cardiac arrest, and sepsis studies in recent years), Scott Bourne (PhD RN with a huge impact in EMS quality and research work), and Brett Myers (former physician leader at Wake County EMS and now the Chief Medical Officer at ESO Solutions). Getting to have the close input and mentoring of these experienced researchers was truly priceless. After introductions, we had a short lecture from David Page on the research process—going from asking a question to reporting an abstract, poster, or paper. And then we dove into the actual work! David led a brainstorming session where we filled a whiteboard with research ideas, then picked our favorites. This led to four groups of two each focused on four interesting research questions, with a faculty member assigned to each group. After refining our research question, each group presented our project to the workshop as a whole and we spent time critiquing and clarifying how we would approach research. Wednesday, we began by doing literature review and developing our data collection request. For me, this was a high-value part of the workshop. Our faculty mentors provided a lot of insight into how to refine a research question into a testable hypothesis and how to structure your data to get usable results on the other end of collection and analysis. This part of the research process is often not appreciated. For our groups, we had five million deidentified EMS records to draw from, but needed a clear definition of how we would test our hypotheses in order to create a specific list of what we needed collected and analyzed. As we began getting our data, each group continued to further write abstracts and do initial analysis. We concluded Wednesday with a group dinner. Thursday morning, we finished examining our data and assembling draft abstracts and presentations. At 10:30 am, after rushing in with last-minute edits, we presented our research projects and findings for an audience of our peers and of staff from ESO Solutions. Our abstracts are still being refined and will be submitted for publication in the coming weeks and months. But the preliminary presentations from all four groups were exciting and showed us how we could do real research and find useful, important results. This highlighted one of the big takeaways of this workshop for me. Typically, these sorts of workshops do some kind of “toy” project where you apply concepts and principles but don’t actually create something real and valuable. 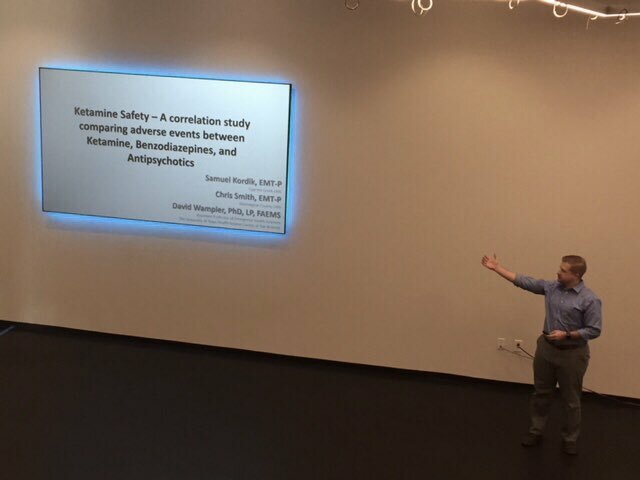 This workshop was different—we did real research, investigated timely and relevant questions for EMS practice, and produced significant results that can contribute to the overall body of knowledge. The other tremendous takeaway from this workshop was the networking opportunities. I felt like I was in a room full of “my people”—folks who were passionate about prehospital medical practice, quality improvement, research, and leveraging data to improve the care we deliver to our communities. There were a lot of offline conversations with other participants and faculty that gave me ideas and solutions to take back to my job and improve my organization. Overall, a tremendous thank you to ESO Solutions, PCRF, and the faculty for putting on an incredible workshop. I look forward to supporting future workshops and seeing the research that comes out of these partnerships! At the ESO Wave conference, several speakers highlighted the coming changes in EMS reimbursement requirements. Although this is not news, it is worth reviewing because these measures are coming, whether we like them or not, and the EMS industry as a whole is not ready for these changes. Historically, EMS has been reimbursed as a transport service: A specific rate is set based on the complexity of treatment provided, and the EMS provider is paid based on miles driven (mostly), with potentially some additional charges for specific procedures performed or medications given. As the costs of providing EMS service have risen, this structure is increasingly not sustainable. Furthermore, the trend in the larger scope of healthcare has been moving away from fee-for-service (where healthcare providers are paid based on services rendered, such as starting an IV, providing a treatment, or in our case, transporting a patient) and towards quality-based reimbursement. In a fee-for-service model, the provider negotiates a price point for each service based on the costs involved in providing that service along with a profit margin. Even in the case of a non-profit EMS agency, such as mine, a profit margin is necessary to cover the costs of improving stations, buying new ambulances, and of course, providing 911 service to those that can’t afford or don’t pay. A more progressive approach to paying healthcare providers sets a flat fee for each patient or case. If the services rendered exceed this fee, the healthcare provider loses money; if they can cut costs, they will make a profit on that patient. By improving incentives, this approach motivates healthcare providers to cut costs. This has to be tied with quality measures; quality-based reimbursement can be applied to this per-capita payment model or to a fee-for-service model by applying discounts (or bonuses) to healthcare payments based on the quality of care provided. Under this scheme, an EMS provider may receive a 5% bonus if they can do a 12-lead EKG in more than 75% of all cases of chest pain, for instance1. The first key challenge EMS will have is demonstrating that they deserve payment based on quality outcomes, not just demonstrating a service was provided. In order to justify higher payments, EMS providers should demonstrate they deserve this. Of course, the best measure would be overall patient outcomes. However, this is hard to measure and near impossible to show a difference in (with the exception of expensive, carefully constructed clinical trials). Instead, EMS agencies will be required to report quality metrics in order to receive payments, and the amount of payment will depend on excellent performance in these metrics. Documentation: These metrics will be measured automatically using data reporting from patient care documentation. In the case of the proposed pediatric seizure measure2, writing the blood sugar in the narrative will not be adequate. It will have to be recorded in the appropriate field in the chart. EMS agencies will have to improve documentation quality in order to avoid skewing these quality metrics negatively. Education: Providing quality care requires education. Unfortunately, many EMS personnel have not kept up-to-date with the current educational standards and EMS organizations will have to provide additional training to help them understand what current quality standards are expecting. Apathy: EMS personnel run the gamut of motivations. Many are exceptionally interested in helping their community and excel at providing great care. Sadly, many get apathetic and complacent; for them, it’s good enough to take the patient to the hospital. That will not meet clinical quality of care standards. Sadly, this apathetic attitude is commonplace in large urban fire-based EMS systems where the ambulance is seen as a drudgery on the way to a real firefighting job. Clinical Performance: ESO shared some baseline performance numbers of a few measures, aggregated from several million patient contacts across EMS agencies nationwide. They weren’t great. We have a long way to go to provide quality care on a national basis. EMS agencies can begin tracking some of these performance numbers now, and looking for ways to improve them. The EMS Compass project is working to define some industry-standard measures of quality, and the American Heart Association’s Mission: Lifeline recognition is a way that EMS providers can be recognized for their quality of care right now, as well as compare themselves to national benchmarks. The other challenge coming for EMS agencies is being able to demonstrate true cost accounting. CMS will require some form of demonstrating that the charges we are seeking to be reimbursed for are based on a real cost structure and not pseudo-made-up numbers. Cost accounting requires an in-depth knowledge of the labor and supplies used in providing patient care as well as how fixed costs (such as stations, ambulances, and administrative staff) are broken down between different patient care episodes. Not only does this rely on good record-keeping and a deeper understanding of EMS operations, it also requires accounting know-how that exceeds that of most EMS system managers. Developing this knowledge and expertise within EMS organizations will be essential to meet the expectation that we bill fairly. What Happens If We Come Short? EMS providers that miss the mark will see reimbursement income will decline, and as a result, will be forced to shrink operations. Tax-payer supported EMS services, including fire departments, will face external political pressure to improve operations, leading to leadership changes or service model changes. Non-subsidized EMS services, including some of the larger for-profit entities, will struggle financially (anecdotally, quality-driven performance has been largely absent from these organizations in the past, so they may have more of a challenge to adapt). They may require taxpayer subsidies where there were none. In some cases, municipal EMS services may be privatized, with local governments contracting with non-profit or for-profit EMS providers instead of providing service themselves. Reforming the culture of large, urban, fire-based EMS systems may prove impossible. Hospitals are already used to these changes, and hospital-based EMS providers may have an advantage in meeting quality and accounting benchmarks. Based on evidence, not tradition. Evidence includes both published clinical research and internal data analytics tools such as performance metrics and KPIs. Patient-centric; each patient is unique and treatments are based in a diagnostic assessment. Aimed at improving outcomes within the context of the greater healthcare community. For different patient populations, this could mean not going to the hospital; or delivering advanced critical care medicine as close to the point of injury/point of illness as possible; or providing minimum stabilization and rapid transport to definitive care at an advanced-level facility. This blog will explore these concepts from the perspective and experience of a senior paramedic leader and educator.